It is no secret that catfish will eat almost anything. Anglers are adding the artificial lures to their arsenal of more traditional catfish baits. There are the plastics impregnated with attractants. And then there are the chemical mixtures of both natural foods and various other ingredients. Even crankbaits and other hard body lures are coming into use. Both flathead and channel catfish will attack artificial lures. Beginning in late summer as the water temperature gets into the 80’s and low 90’s channel catfish move to the shallow water up tight against dams. The flatheads move to the deep holes. In both of these areas, catfish will take an artificial lure. Using bass fishing techniques to catch flatheads, a fisherman begins by trolling with a trolling motor on his Jon boat. By trolling over holes modern electronics help him spot fish on the bottom. Experience says flatheads about to go on a fall feeding spree. Look for structure in the holes. Submerged trees, rock structure or any other kind of “home habitat” that flatheads are known to frequent. Bounce jigs right on their nose. Use a 2 ounce jig with a salt craw attached. In order for the fish to take it the jig has to be right on him. Not being a bottom feeder by nature, the flatheads eyes are located to find food slightly above it. Late summer also means low water conditions on most rivers. Cats, be they flathead or channel, seek out deep water, fast running well oxygenated water, or both. Beneath most dams are deep holes created by the water cascading from one level to another. 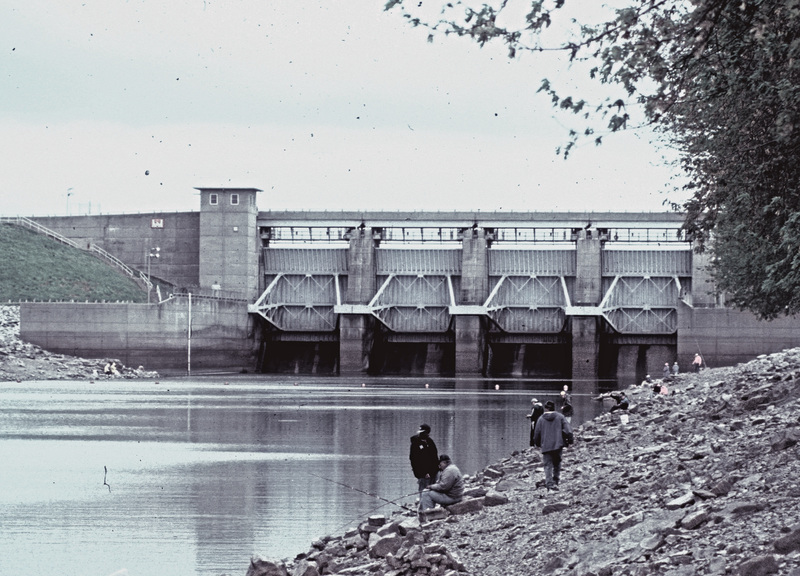 Anglers have long known that casting up under the dam they can catch fish. But, few try it with a small jig. A 1/8 ounce leadhead with a dark plastic grub body will do a good job enticing channel catfish. With care, the shore angler can catch nice cats, holding in the highly oxygenated water found below dams. One needs to exercise extreme care in this fast flowing water with all the washed out holes. Over on the Ohio River flowage, some anglers use crankbaits to catch fall cats. They get their boats right up in the shallow water at the dam and then cast floating Rapalas. The river flow helps to provide action to the lure. The #13 and #18 are most used. Blue is the preferred color. The use of artificial lures to catch catfish is relatively new. But we will probably hear more about them in the future. The Ohio River has a long and varied history. It can be the mother of commerce or it might turn against civilization with floods beyond imaginations. But to the angler it can lead to tributaries plump with a number of game species. Nestled beneath a large bluff on the Ohio River, is the Golconda Marina, gateway to Smithland Pool. The marina is the entrance to the some 23,000-acres of recreational water that is the river and its tributaries. Unusually wet weather swells the normally placid looking main channel with high water. It is not so much the volume of water that crimps the fishing in this region; it is the junk that washes downstream during the high water. It can make navigation dangerous as huge cottonwoods floating down from areas to the northeast can damage a boat and snag fishing gear. Smithland Pool refers to the section of the Ohio above the Smithland Lock and Dam at Hamletsburg. The pool is more than 72 miles in length. The shoreline, numerous islands and deep clean water attract thousands of anglers each year. They prowl the shoreline in search of largemouth bass, smallmouth bass, Kentucky spotted bass, crappie, bluegill, walleye, sauger, striped bass, white bass and catfish. Located in the town of Golconda, the marina offers overnight moorage, covered slips, boat rental, gas, diesel, shower facilities, mechanic service, and food. 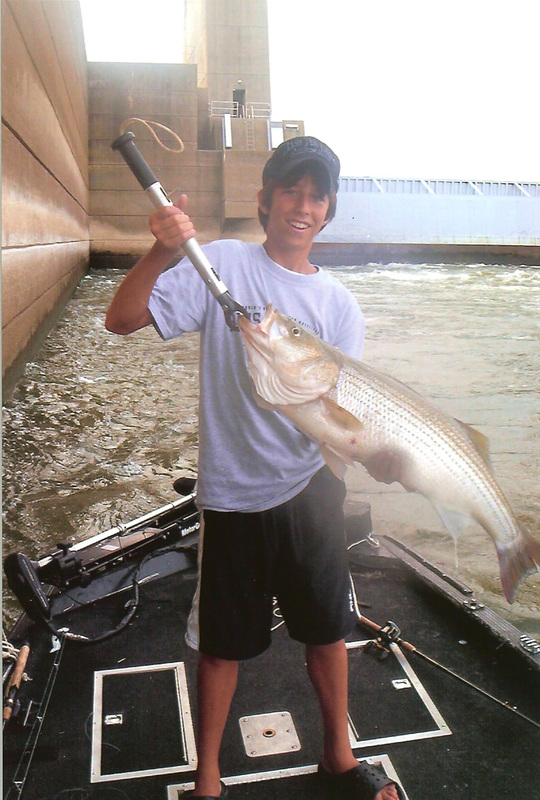 Down river, the Smithland Lock and Dam is an exciting fishery of striped bass and hybrid striped bass. These battlers are very challenging in the current of the river. Anglers target these fish with big surface poppers, plastic jerkbaits and jigging spoons. The fishing is best as the river is on the rise as well as when the water levels run about 35 feet. Good locations for those looking for these scrappers are the heads of islands early in the morning and late in the evening. When the locks are open the stripers seek out the fast flowing water that washes bait fish through the dam. Largemouth bass inhabit the river. Generally the better bass action is in the feeder creeks just off the main river channel. 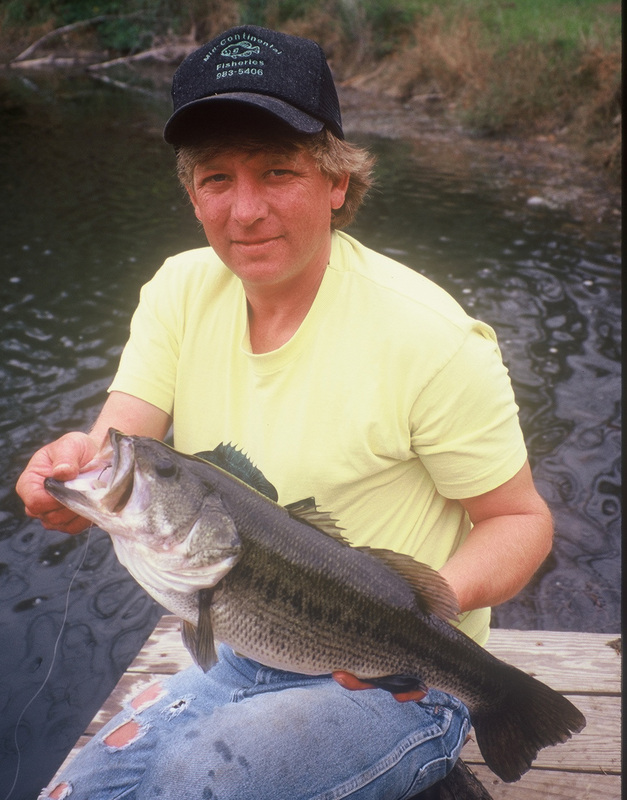 The brushy areas and stump fields of Lusk Creek are the most popular area for bass anglers. The mouth of the creek is just a short distance from the marina and convenient to enter. One just exits the marina cove and enters the first creek to the south. The best summer fishing times are from dawn to about 9:00 a.m. and two hours before dusk until the light is gone. During summer months, bass require a little finesse in lure presentation. Slow roll spinnerbaits in standing timber of the old channel. Following any rain, the creek tends to muddy up. Then it is time to get out the salt craws. Black, electric blue and chartreuse are the best colors. Again it is good to fish the wood, any wood, which is just off the main channel. Best known as a catfish factory, the Ohio has huge numbers of channels and blues. Anglers present natural baits such as cut shad on the bottom near current breaks. The best time to go catfishing seems to be when the water is rising or is at a high water mark. The action seems to be best in about 10 to 18 feet of water and near the wing dams on the river. For the bluegill anglers, the streams agree the best bet. Good quality fish will take baits such as worms, pieces of shrimp, or crawfish. Work the baits around the submerged tree tops and brush. Crappie anglers jig with long poles back into the wood. They “dip minnows” near the wood seeking big fish resting in the shade. The key is to jig near visible cover. The creeks have plenty to choose from. Although the best known fishing locations are downstream from the marina, there are numerous feeder creeks to the upstream side. In all the 51 miles stretch between Smithland Lock and Dam and the Saline River, there are 10 major and 12 minor streams entering the river from the Illinois side. An additional 8 major streams and 5 minor ones enter the river from the Kentucky side. A number of years ago sitting down with an elderly fellow, a dedicated fan of the Silver Buddy blade bait, provided an introduction to a wealth of information on the use of this casting spoon type of blade bait. There are a number of similar spoons on the market but the old timer swore by the Silver Buddy. He explained that one can gain confidence in the lure by using it. The versatility of the blade bait is apparent regardless of the time of year. It is effective on schooled fish and yet works equally well seeking fish that are relating to structure. A number of different species will attack this unusual looking lure. Blade baits can be jigged vertically or cast out like a crankbait. It can be used anywhere one would want to use a lipless crankbait and it can be slow rolled like a spinnerbait. It can even rattle like a lipless crankbait. If this bait is so perfect, why do not more anglers use it? Probably because they just have never tried it or are not sure how it fish this contraption from the southern states. When the water temperature is between 38 and 60 degrees, it seems that fish have a tough time catching heavier lures. A high percentage of fish are foul-hooked outside the mouth. Reasoning that you need a lighter slower sinking lure, makers of tackle came up with blade bait made of a zinc alloy that is lead free and still has a hook noise. Lead tends to deaden noise of the hooks hitting the blade, but zinc produces a lot more sound. The difference is the same as the difference between beating two sticks together and ringing a bell. The lure also is lighter and flutters more on a slow fall. Blade baits in general are a simple blade to work. They are presented in three ways dabbled or vertical jigged, jigged beneath a slip bobber, or cast and retrieved. The beauty of this lure is its versatility. You can retrieve it quickly, allowing for the covering of more area. That increases the odds of attracting a bass’s attention. It also has a bait fish profile. Coupled with a lot of flash and a tight wiggle, it gives the appearance of a baitfish darting to escape. Buzzed across the surface with a steady retrieve interrupted with a brief fall make true blades are deadly. Casting and retrieving allows the angler to scour a weed line or the edge of structure. By finessing the blade bait, the angler can lower the bait into the school or near structure, hop it up and follow it down with the rod tip. Fish marked with sonar, are sitting ducks once you position the boat over them with a trolling motor. Without a trolling motor, the angler can anchor upwind of the school and allow the boat to drift at the end of a long anchor rope until it is over the fish. In dabbling you drop the blade into shallow sunken timber using a long jig pole or fly rod. It is similar to jigging but the angler gives the lure considerably more action. A flick of the wrist will give a lure a hopping action. The slip bobber approach is tying single small blade bait beneath a slip bobber that adjusted to keep the lure just above weeds. The angler casts the lure, lets the blade settle. He then begins to jig it bringing the line through the bobber. The lure then begins to vibrate. This procedure works well around timber with 8-pound line. You may use lighter line in open water depending upon the species sought. Blade baits are particularly popular with anglers seeking white and hybrid‑white bass in some of the larger impoundments. Probe large schools of fish with the bait as the fish feed on shad during the fall. Cast heavier lures beyond schooling fish and bring it back through them. Because the lure does not land on top of the fish it will not spook them. Begin with a steady retrieve through the schooling fish and then let it fall. Usually the bigger fish are below the shad, and the falling bait gets down to their level. Blade baits all have their place in the tackle box. Each has its own vibration, shape and sound. With a little practice and experimentation, one can find the one that is right for the situation at hand. Why not give them a chance. To the casual observer bank fishing can amount to just sitting in a lawn chair, sipping a soft drink and listening to the ball game on a radio or stealthily working the shoreline in search of feeding fish. Regardless by following a few simple rules one can have a great day in the outdoors. The key to fishing from the bank is finding structure and/or vegetation in the water. Fish follow pathways along and around structure. They will follow one kind of structure until it intersects with another. Seldom do they cross large expanses of open water. It makes they feel vulnerable. If an angler eliminates those large expanses of water from his pattern, he cuts down the amount of water he explores thus improving the odds that he will find fish. It is smart to fish areas with two different kinds of structure intersecting. This can be where weeds meet a fallen tree or rocky area. Areas around rocky points, dam faces, or jetties can also contain vegetation that attracts fish. Other promising locations are where feeder creeks or canals bring warmer water, oxygenated water and washes in insects from flooded areas upstream. Creek channels provide pathways between structures. Fish often use old creek channels as they move from weeds to brush or shallow water to deeper water. Deep water drop-offs are popular with fish. It provides them security of deep water yet allows the opportunity to move up into warmer water of flats to feed. Additional locations along the bank include such areas as those with partially submerged trees or trees that have fallen into the water from the bank. Vegetation such as water willow, cattails, weeds and lily pads also provide food, shelter and a safe refuge from predators finny or on two legs. For those in search of smaller species, such as crappie, sunfish and bluegill live bait is best. The bait can be small minnows and pieces of nightcrawler. The amino acids in live bait are an attractant to fish coming out of a long winter of minimal activity. They also feed on zooplankton and insects found in and near vegetation in the water. The larger predatory fish, such as bass, artificial lures are popular. When working a lure through an area it is important to work it thoroughly. Fan casting a dozen or so times is a popular method to cover lots of water. However the most productive areas tend to be closer to shore as opposed to those out further. The water closer to shore is warmer and more likely to have structure. When working artificial lures it is wise to vary the speed or the retrieve and the depth at which the lure might run. It is important when working water from the bank to remain flexible and portable. If a given location is not producing any strikes or bites in 15 minutes, it is time to try another one. You have to be where the fish are located. A summer of record rainfall has resulted in high water situations in most of Illinois lakes and rivers. As a result many fish washing over dams creating rejuvenated fisheries n the tailwaters downstream. Tailwaters are changing habitats and fishing them can be frustrating. What is a good area one day washes away by changing water conditions. Floods move logs and wash away points. Tailwater addicts welcome the challenge providing some of the best action regardless of the species sought. Catching a first fish downstream from a power dam in northern Iowa made an instant tailwater addict out of the 5 year old. It was a 6 pound bass and was caught on nightcrawlers from his grandmother’s garden. The nightcrawler floated below a bobber on “cat gut” line attached to a bamboo pole. I was the youngster in question. The roar of water rushing over a dam or through a spillway makes the water flow become highly oxygenated. Baitfish seek shelter in eddies which attract predator fish. One can fish for numerous species. To an angler, on shore or in a boat, it provides action not often available in other water. Tailwater is the generic term for all water downstream of a dam. Although spring is best for tailwater fishing, these waters provide fishing action through the year. The fishing is consistently good because the fish tend to congregate near rough water where they find ample food. Dams fall into four basic types: navigational, wing dams, stationary and spillway dams. Deeper pools upstream from a dam tend to be more popular with recreational boaters and swimmers. Often the water backs up into low lying areas to form wetlands for waterfowl and other wildlife. Wetlands also filter the water which is later used for human consumption. Tailwater below a dam contains water of relatively stable temperature. The churning action oxygenates the water making it useful in attracting and holding baitfish. The current creates shoals, pockets of slack water, fast turns, rocky points, creek moths, eddies and deeper pools. Although fishermen ply the humps, underwater islands and secondary points downstream, the best action is right below the dam. The immediate area downstream from most dams contains wing dams, rip rap, turbulent water discharged by turbines and often deep pools. Changing water configurations present a challenge to anglers. Wing dams are often good places to find white bass, catfish, drum, saugers and walleye. Patterns, lures and presentation vary from one tailwater to another. Some basic tips include remembering that tailwater fish are feeding on dead or injured baitfish. Spoons and jigs imitate wounded prey and are a good choice. Depending upon the current larger fish is generally found along the edges of the fast water. It is easier for them to sustain their position in the slow water and yet dart into the fast water as “lunch” washes past. Eddies formed below dams have a current that runs opposite to the direction of the main river flow. They occur behind logs, stumps, large rocks, and points of land. When the current flow hits one of these obstructions it changes speed and direction. The flow becomes either a slack water or a slow water area. Cast upstream and allow the bait to drift into the eddy. Bucktails and rubber-skirted jigs can be drifted into the dead water areas and then pulled back out into slow water. Slow water areas attract crawfish and insects washed from the fast water into the calmer area. Predator species see this as an easy food source. The upstream portion of an eddy contains the more aggressively feeding fish. Side channels beneath a dam are water separated from the main channel containing current during normal water stages. Often they are passages around small islands. The population of fish in them is generally the same as that found on the edges of the main channel. Fish such as white bass, catfish and drum like the side channels. Perhaps the most popular way to fish tailwater is with a heavy weight on a three-way swivel. As water washes over a dam it creates groove areas down stream. The heavy weight will settle on the bottom and allow bait to suspend just a little above it. This rig is most commonly used for catfishing, a very popular tailwater activity. The screech of the reel is a dead giveaway for some rockfish action on the Ohio River. 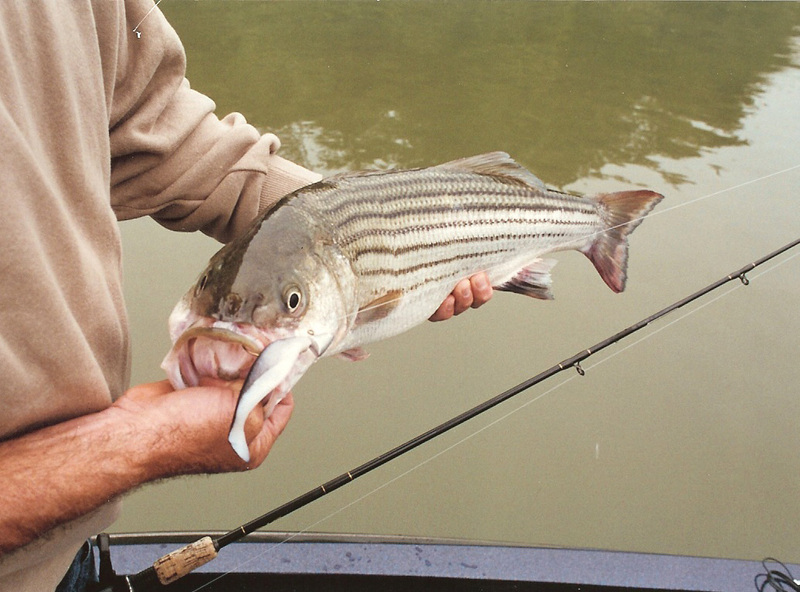 Even if they are not on the agenda today, rockfish, or as they are often known, striper can be a surprise for catfish anglers. Both species like the taste of nightcrawlers. The rockfish is a saltwater relative of white bass. It resembles the white, but is more elongated and less compressed with nearly straight back. The color of the rockfish is a dark green to blue on top with sometimes brassy tinge which becomes lighter on the sides. Its underside is silvery. Most prominent are the seven to eight narrow stripes along the sides going lengthwise giving birth to the name striper. Weights vary, but generally they are about 5-pounds by their third year. Fish in the 20-plus range are not unusual. Created in the 1960’s these fish come from fry originally introduced into Lake Barkley. 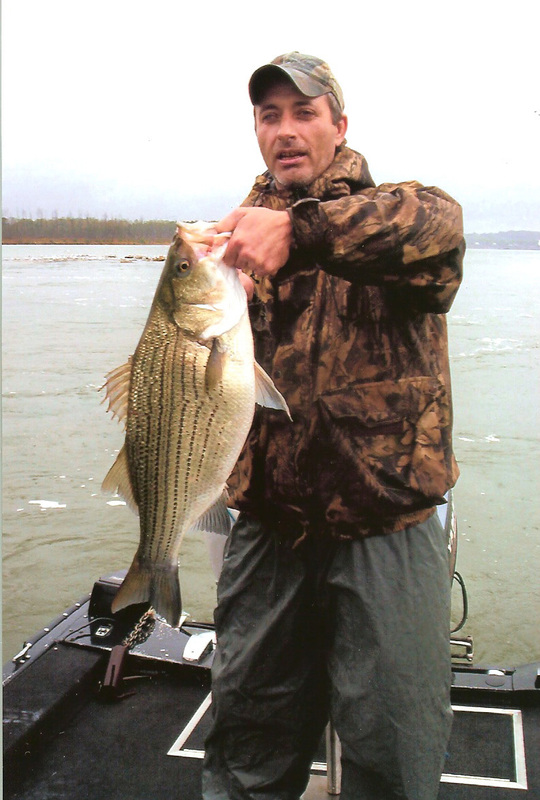 They flourished and with addition of some larger fish in Kentucky Lake the striper as a game fish became popular with anglers. Later due to flooding, the fish established themselves in the Ohio River. Feeding on shad they became popular with anglers. As they will eat both threadfin and the larger gizzard shad they seem to prefer the smaller threadfin. Their ability to eat the larger gizzard shad aided the other game fish which could not feed on them. Although they spend most of their time roaming deep water, rockfish will move to more shallow water in dam tailwater to spawn and to pursue shad. A stout 7-food rod with a flexible tip is a good choice for angling. A flexible tip allows the fish to grip the bait without meeting a lot of resistance before he is well hooked. Although this fish took a nightcrawler, and others do from time to time, the preferred bait for them is threadfin shad. A shad that is lip hooked on a circle hook is hard to beat. 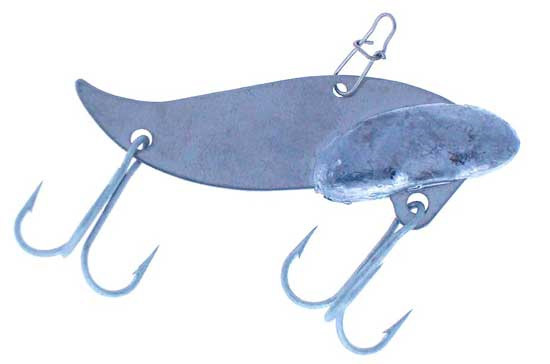 However, most anglers use a Kahle style hook. Areas like this one downstream from a dam or lock contain a lot of riprap and some concrete or boulders are good prospects for finding fish. The gizzard and threadfin shad are attracted to the plankton and algae in the rocks strewn area. The rockfish follow then in and feast on the shad. Basically rockfish are found anywhere with a current break and an ample food supply. Whether fishing for rockfish or accidentally hooking into them it is an exciting experience and they are good eating. Our best fighting fish is a pretty apt description to anyone who has ever hooked one. These shad eating machines prowl a number of Illinois waters providing excitement for any angler who is lucky enough to hook one. A wonderful fighting fish, this transplant to Illinois waters spends most of his day roaming deep water in pursuit of threadfin shad. Stable water conditions, clear skies, and the presence of shad cause this wolf of the water to move into more shallow water and dam tailwaters. Once there, their presence is visible by the action on the surface. Stripers will force shad to the surface and then crash the surface as they goggle up the hapless bait fish. In tailwater situations the striper takes advantage of the injured shad that wash through locks and over dams. Most stripers and hybrids bite on live threadfin shad or skipjack. Some people have good luck with cut bait while others prefer artificial lures. The Illinois State Record is 31 pounds 7 ounces for striped bass and 20 pounds .32 ounces for hybrid striped bass. The average fish from these species range from 2 to 15 pounds. Most anglers refer to both the hybrid striper and the pure strain fish as “Stripers.” The hybrids are not able to reproduce and have some different physical features that make identification possible. A saltwater relative of the white bass, stripers resemble them in appearance but have a more elongated and less compressed body. Stripers have a more straight back and they are dark greenish is color on top with a brassy tinge that becomes lighter on the sides. The underside is a silver color. The most prominent feature is the presence of seven to eight narrow horizontal stripes along the sides which leads to the name striper. The stripes on the Hybrid are less distinct and definitely broken. The first stripe below the lateral line is distinct and complete to the tail. Hybrids tend to grow faster making them popular for stocking. Hybrids can reach 5 pounds by their third year. These imports are present in some 28 waterways and lakes of the Prairie State. They consist of three subspecies: striped bass, hybrid striped bass and striped/hybrid striped bass. Regardless of where in the state a fisherman lives, he is but a couple of hours away from a striper fishery. Historically, the IDNR has had problems meeting the stocking needs for this fishery. Today they are able to produce a reliable good quality source of fry. State hatcheries are involved in the production of striped bass and hybrid striped bass using fry purchased from out of state. Currently Illinois stocks both striped bass and hybrid striped bass. The best angling opportunities center on following the shad. Both threadfin and gizzard shad are the primary food source for all three subspecies. Many are caught incidental to fishing for other species. 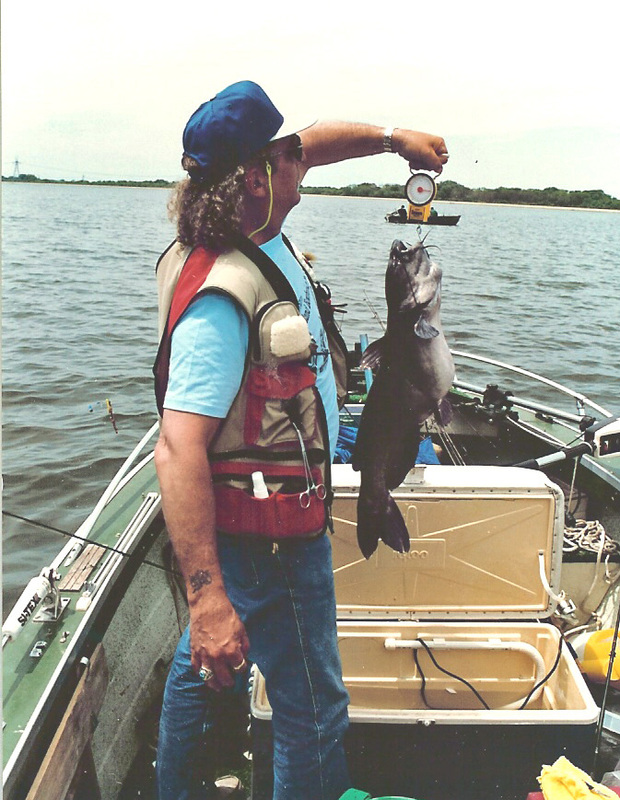 Catfish anglers will often catch them in the spring using chicken livers fished near the bottom of a lake. Most fish are caught trolling shad or shad-like imitation baits. Both live bait and cut bait from shad work well. The use of electronic fish locators allows the angler to locate schools of shad. Then the angler knows at what depth to troll his offering. Shore anglers look for points and deep water flats near current. Current is a chief locator to find stripers. Perhaps the best cure for fingers numbed by the cold and the chill of cold winds is the screech of a reel paying out line. The sound of the reel means striper on the other end of the line.